Studio portrait of Australian Prisoner of War (POW) 3387 Private (Pte) Frederick Alfred Scott Nicholes, 53rd Battalion from Sydney NSW. 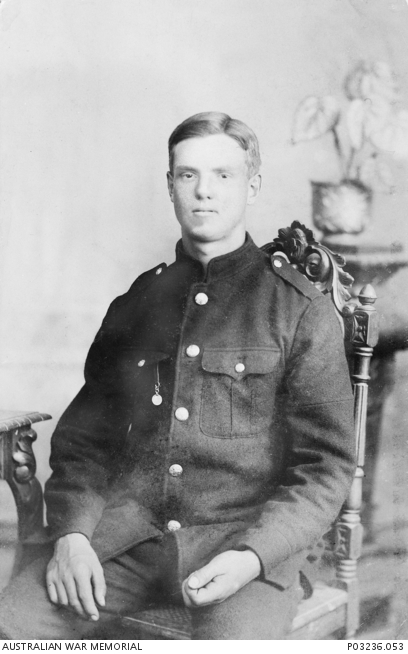 Pte Nicholes enlisted at the age of 19 on 10 August 1915 and embarked for overseas on 2 November 1915 aboard HMAT Euripides. He was captured at Fleurbaix, France on 20 July 1916 and held in a number of German POW Camps. He wrote on 27 January 1918 from Schneidemuhl “Am in good health.” Pte Nicholes was repatriated to England on 18 December 1918 and arrived back in Australia on 7 April 1919. One of a series of over 400 photographs sent by Australian POWs in German camps to Miss M. E. Chomley, Secretary, Prisoners Department, Australian-British Red Cross Society, London. Original album housed in AWM Research Centre at RC00864, Album image number 73.